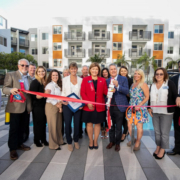 ORANGE, CA–(Marketwired – Mar 24, 2015) – The Picerne Group, in collaboration with Rockwood Capital and The Muller Company, have formed a joint venture on a 2.76-acre site to build ELEVEN10 West, a 260-unit multifamily rental community one-block from the Children’s Hospital of Orange County and St. Joseph Hospital Orange, Calif. This new development is expected to open for lease in summer 2017. A five-story podium building at 1110 Town and Country Road just off Main Street is being designed by TCA Architects. It will include 43 studios, 117 one-bedroom and 100 two-bedroom apartments for a total of 224,293 rentable square feet. With a contemporary architectural style consistent with the objectives of an Urban Mixed-use zone, the community will improve the area with a variety of high quality materials including wood siding, metal awnings, and burnished block. The massing and articulation holds the street edge while complementing the scale of the surrounding uses. The ELEVEN10 West community will include more than 500 parking spaces, three interior courtyards, with the massive primary pool courtyard consisting of more than 13,000 square feet including: pool, spa, cabanas and lounging areas, an outdoor entertaining space with gaming, a state-of-the-art indoor/outdoor fitness center, and a catering-style kitchen. Wi-Fi will be available in all common areas, ready for every opportunity to work or play. ELEVEN10 West was designed to coincide with the City of Orange’s General Plan’s mixed-use vision created in 2010. Picerne Group is helping to transform an underutilized commercial site into a pedestrian-friendly horizontal mixed-use development with quality housing close to employment. The community is adjacent to a 16-story Class A office building constructed in the late 1980s as part of the first phase of development. “Picerne cannot begin to thank the City of Orange enough for placing their faith in our firm to execute their vision. 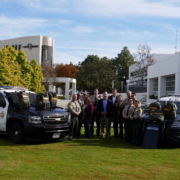 We are honored to be doing business in the City of Orange,” Perozzi said. The community is also near the Westfield MainPlace Mall and Orange Town and Country Shopping Center. Visibility and access are excellent from the 22 freeway, and the 5, 57 and 55 freeways which are all close by. According to the National Association of Home Builders’ formula to determine the local impact of multifamily housing in typical metro areas, adding 260 rental apartments will generate $8 million in local income, $1.9 million in taxes and other revenue for local governments and 138 local jobs. 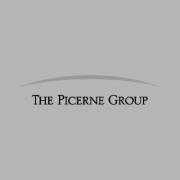 The Picerne Group (TPG) is a privately held, Southern California-based real estate investment firm that focuses on real estate investments nationwide, as well as best-in-class asset management. TPG has successfully invested more than $1 billion in real estate equity and debt, diversifying investments across a variety of property types and geographies in the United States. The firm’s executive committee members combined have decades of experience in managing complex portfolios of residential and commercial real estate, joint ventures and loans. Additional information is available at www.picernegroup.com. 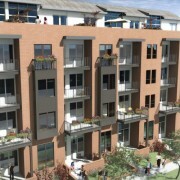 DENVER, CO–(Marketwired – Sep 30, 2014) – The Picerne Group, a privately held real estate investment firm based in Southern California with a regional office in Denver, has broken ground at Venue on 16th, a 180-unit rental community on 1.73 acres in Denver’s City Park neighborhood. Construction is expected to be completed and ready for leasing by late 2015. Approximately 25 people, including Denver City Councilman Albus Brooks, attended the groundbreaking ceremony on September 24. The 155,000-square-foot five-story apartment building, designed by Denver-based JG Johnson Architects, will include 14 studios, 99 one-bedrooms, 63 two-bedrooms and four three-bedrooms, wrapped around a 243-space garage on the first level and a podium courtyard and pool on the second level. Interiors will be contemporary in design with gourmet kitchens including stainless steel appliances, granite countertops, European-style cabinetry, wood plank-style flooring, oversized bathtubs and mudrooms with ample storage and bike racks. 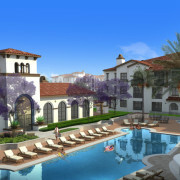 Residents will have access to a resort-style pool and spa with cabanas and barbecues, a top-floor sky lounge with views of the mountains and City Park, a state-of-the-art gym and yoga studio, a pet-washing station, bocce ball court, bicycle storage and maintenance room as well as car charging stations. CFC Construction, an industry-leading construction company based in Golden, Colorado, is the general contractor. According to the National Association of Home Builders’ formula to determine the local impact of multifamily housing in typical metro areas, adding 180 rental apartments will generate $14.2 million in local income, $1.4 million in taxes and other revenue for local governments, and 220 local jobs. 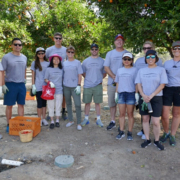 The Picerne Group Breaks Ground on New Multifamily Residential Project at Prime Location in Ontario, Calif.
ONTARIO, CA–(Marketwired – Aug 1, 2014) – The Picerne Group, a privately held real estate investment firm based in Southern California, recently broke ground on Vistara, a Class A, 298-unit apartment community at Haven Avenue and 4th Street. This project is expected to be completed and ready to lease by the 2nd quarter of 2015. The groundbreaking ceremony took place on Monday, July 14 and was attended by several city officials including, to name just a few, City of Ontario Mayor Paul S. Leon, Mayor Pro Tem Alan D. Wapner and City Council member Jim W. Bowman. The community, which is being built on 11.29 acres of currently vacant land, is less than three miles from the Los Angeles/Ontario International Airport, the Ontario Mills® outlet mall with 200+ stores and Citizens Business Bank Arena, the largest and most modern sports venue in the Inland Empire. It also offers convenient access to two main transportation arteries of San Bernardino County, Interstates 10 and 15. 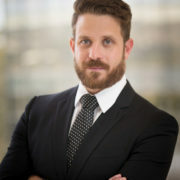 “We want to thank the city of Ontario for implementing the vision for placing residential in the Ontario Business Center, so that employment and high quality housing can co-exist with retail and entertainment, which will complement the community in the future,” said Brad Perozzi, The Picerne Group’s managing director of Southern California development. Designed by Architects Orange, one of Southern California’s most respected and sought-after architectural and planning firms, Vistara will appeal to young professionals and families who can take advantage of the top-rated schools in the Cucamonga School District. The location is a gateway to all the recreational and cultural opportunities Southern California has to offer — mountains, deserts, beaches and theme parks — including the Arnold Palmer-designed Empire Lakes Golf Course. 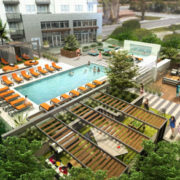 The project will consist of one-, two- and three-bedroom units, a resort-style pool and spa with barbecue and fire pit areas, a clubhouse with media and game components, state-of-the-art fitness center and Wi-Fi throughout common areas. 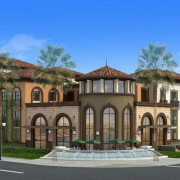 Lush landscaped paseos will wind through the property and shaded areas will provide dining and social gathering areas. The new home interiors will feature fully equipped gourmet kitchens, designer cabinetry and fixtures, quartz countertops, and in home washers and dryers. http://www.picernegroup.com/wp-content/uploads/2015/09/View-2-800x500.jpg 500 800 TPG@support http://www.picernegroup.com/wp-content/uploads/2016/05/picernegroup_logo3.png TPG@support2014-08-01 18:10:132019-02-09 17:04:58The Picerne Group Breaks Ground on New Multifamily Residential Project at Prime Location in Ontario, Calif.
CERRITOS, CA, Mar 25, 2014 (Marketwired via COMTEX) — The Picerne Group, a privately held real estate investment firm based in Southern California, held a groundbreaking ceremony this month at Aria, a Class A, 198-unit apartment community. The site, located at Bloomfield Avenue and Artesia Boulevard, is across the street from the Cerritos Towne Center, an open-air community center that offers shopping, dining and entertainment. The community, designed by Architects Orange, will be a four-story wrap building with studios, one and two bedroom units, and the top floor penthouses have loft space. Amenities will include a deck with a junior Olympic swimming pool and spa, poolside cabanas and seating areas; an outdoor fireplace; a state-of-the-art fitness center with fitness on demand; and a lounge with a catering-style kitchen, gaming tables, billiards and a business center. Aria will appeal to young professionals and families who can take advantage of the top-rated schools in Cerritos as well as a wealth of cultural resources, including the Cerritos Performing Arts Center and nationally ranked library. 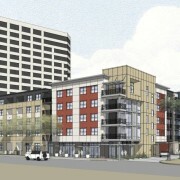 The Picerne Group anticipates construction to be completed in the fourth quarter of 2015 and pre-leasing to begin mid-2015.